An exchange of texts sealed the decision. The nagging south easterly wind and hint of more drizzle meant no ringing the following morning. Some things never change. Over the moss roads I found a regular but shy Barn Owl that would have little of my photography intent as it disappeared into - a barn. What else? In the same area only a year or two ago was an entirely different individual that would hunt long into the morning hours over a well-defined and regular circuit and cared little about a lens poking from a car window. Such are the subtle differences that sometimes allow us to separate one individual from another but where traditional nest sites prove their worth by allowing successive generations to breed in familiar places. New landowners at Braides have changed the landscape. Not to everyone’s liking I hear, with Natural England for one unhappy with the levelling of the previously Under-Stewardship land. There was still a good count of 2000+ Lapwing, a few dozen Redshank, several Curlew and a lone wagtail, but the distant scrape so valuable for wildfowl and waders has disappeared under an unfriendly plough. I’d not been to Conder Green for many weeks and by the paucity of on-line accounts, I had missed little. Except for 3 Egyptian Geese my counts proved strangely resonant of pre-Christmas days with 90 Teal, 45 Wigeon, 22 Redshank, 15 Curlew, 3 Little Grebe, 1 Little Egret and a single Rock Pipit. Christmas and New Year generated visits to Conder Green from bird watchers keen to tick the newly arrived exotic Egyptian Geese, a feral but now established affiliate to bird lists. There are thought to be around 200 pairs of Egyptian Geese in England, mostly in Norfolk and the south-east but the species rarely travels in any numbers to the colder north of England or even the warmer Fylde, hence the bird listers. Whether these three probable siblings will stay around as one into the spring and summer is perhaps unlikely given the species’ known aggressive traits. It was around Christmas that a brutal murder took place on Hampstead Heath. “A pair of Egyptian Geese lived blissfully at Kenwood Pond on the Heath for many years. The original pair mated for at least seven seasons and produced up to seven goslings a year. The male was a good father, protecting his young from aggressive dogs, often rushing his family into the safety of the pond waters. Their lives were ripped apart by a territorial battle between the resident male and an intruder, who returned for a second time having been chased off earlier in the summer. The pair had survived the best part of a decade until the fateful day that the younger but stronger adult, perhaps even one of their own goslings from years gone by, returned to enact a bloody and hostile takeover. A bitter fight ended brutally, with the resident male killed and drowned in the pond below Kenwood House." Around a year ago the same pair were caught in a less traditional drama: a photographer described an incident where the now-deceased male goose took exception to a drone flying near to his family. The drone hovered near the nest and the male took off, crashing into the drone from above and sending it spinning into the water. If only someone had thought to mention this to the assorted politicians, Police, RAF, Army and Gatwick officials watching the invisible drone. Or perhaps the innocent couple who spent 36 hours in Police custody? From Conder and up to Cockersands, the lanes were mostly unproductive. I heard lots of noise around the Tree Sparrow colony along Moss Lane where by now the sparrows are well aware of impending spring. 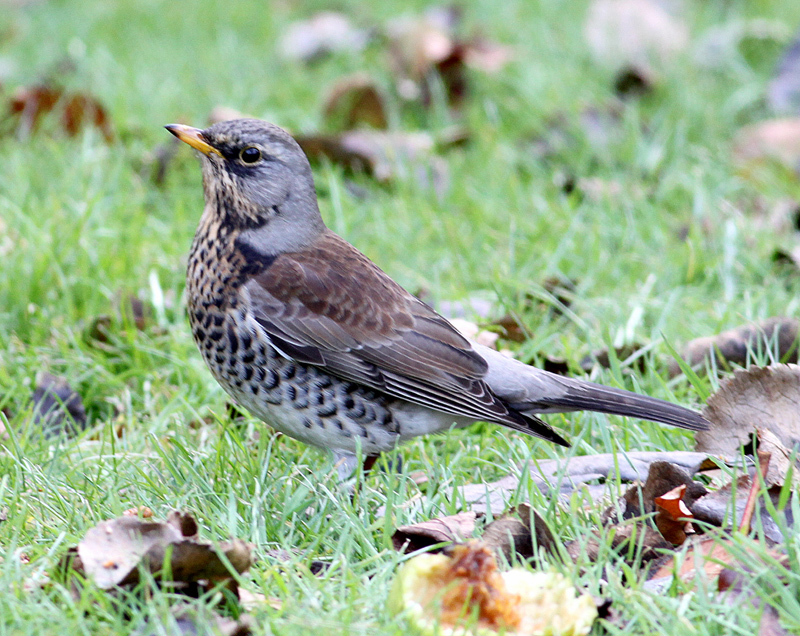 Otherwise there was very little except for a small gang of 40-45 ground feeding Fieldfares and a couple of Kestrels. Fieldfares are mostly absent now, hard to find until their spring passage North begins in March and April. Meanwhile, and despite the dreary weather, the Linnets must be fed even though we aren't able to manage a ringing session. A count of 300 was pretty good and many soon dropped onto the fresh seed I dropped. Maybe next week, but the forecast does not look good. 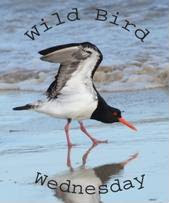 Linking today to World Bird Wednesday, Anni's Birding and Eileen's Saturday Post. Good morning Phil: Obviously a whole new career is a opening up for you, that of a murder mystery writer with an ornithological theme to it all. Perhaps the hero of your series could be Professor Parrot, an academic with sleuthing proclivities, and his assistant Carol Cockatoo, who helps him in more ways than the text divulges. The villains would have to be based on birds like vultures and caracaras, dastardly scavengers, and frigatebirds always stealing the hard earned rewards of others. In your narrative it seems as though Egyptian Geese would have to be worked into the plot too. Maybe Linnets would be portrayed as saintly, saviours of decency and rectidtude. Ringed birds could be lost and then mysteriously show up revealing secrets discovered in their peregrinations, providing clues leading to the apprehension of the villain. Detective Pergerine would be quite aristocratic and skilled in ways we could neither imagine nor aspire to. The possibilities are endless! Hello, Love the Barn Owl photo. It is a beautiful owl. Neat shot of the Linnets lined up on the fence. Great sightings. I am not a fan of drones and glad to hear one ended up in the water. It is sad to hear about the original male Egyptian Goose was killed. Great report and post. Thank you so much for linking up and sharing your post. Happy Saturday, enjoy your day and weekend. PS, I appreciate and thank you for your comment on my blog. You can be a good writer about nature and birds. Thanks for the interesting post! I love the birds. The story of the drone, yes surely they could train a bird to do it!!! We're getting new drone rules here in Canada. You semipro and pro birders have amazing headers, all of you!!! I am struck by the beauty of the Egyptian Geese! well David's comment really amused me and yes, you could take that suggestion up! I saw Egyptian geese in one of the parks in London when I ws there in September. I do not think any have been found in Ireland yet. Have a good week ahead. Sad, but sometimes a necessary evil of survival of the fittest. I don't have to like the outcome tho. We had a rogue egyptian goose in town for nearly a year & it left, not to return. That photo of the high numbers at your 'feeding station' is wonderful to see. Here's hoping for you a beautiful week ahead, and good birding ...thanking you for letting us experience your blog post linked at I'd Rather B Birdin'. I am surprised there are only 200 pairs if Egyptian geese in the UK, I am used to seeing them in numbers, but maybe I am thinking of RSA!! I have done very little birding in the UK, and when I have it is all birds that are around Devizes! The murder story is quite sad but I guess nature takes its course. The Barn Owl is a beautiful bird and great photo. I tramped through the woods last week trying to find an owl. I heard 2 calling to each other but the one I was closest to got real quite when I got close and I never saw it. Hope you're having a good Sunday. It's cool and windy here today and I'm taking the day of! I visited Hampstead Heath and Kenwood more years ago than I can remember, but I do remember it was a lovely place to enjoy a Sunday (or Saturday) walk. Love the photograph of the barn owl. Hope the new week ahead will be a good one for birding - stay warm. 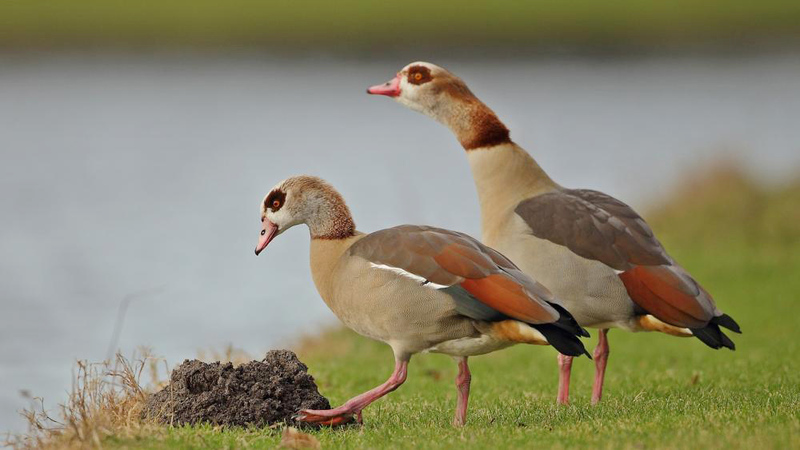 The Egyptian geese are quite eye-catching - have never seen anything remotely like them. Beautiful photos as usual but your story was captivating. I'm sad for the resident goose even though I know that is nature at work. I felt like I was reading a good novel. The Egyptian geese are very attractive. Maybe you need to email Heathrow and Gatwick with your findings. The Egyptian Geese are certainly very photogenic but personally I would rather see and photograph the Barn Owl. You have a very different attitude to non-native species in your country from out here. Not sure why but some out here are quite strident about it all! Phil - having just read the Spain post, I was a bit anxious over the title of this post, so somewhat relieved to know the murder was a 'natural' one … Loved the picture of the barn owl, as always! ‘Nature red in tooth and claw’ huh? Reminds me of the drama at “our” bald eagle nest a few seasons ago, when the old male was killed by a younger intruder. He has proved to be a good mate and father so far. Life goes on. That drone story though! That is quite something and definitely not natural. With the past two posts of slaughter and murder I thought I had stumbled onto a current news web site. The most recent post produced pangs of jealousy due to your photograph of a wonderful Barn Owl. One of many nemeses for my struggling efforts with a camera. I hope the new land owners turn out to be good stewards, however, I shall not be holding my breath. In the short-term, I'll wish a spell of good weather for you soon - and often! The infuriating reports of bird slaughter are, sadly, not restricted to the Old World. Hunters in the U.S. make donations and proceeds from permits go toward habitat and species management. With no need to harvest game for human survival, how about we stop killing the birds and animals altogether? That would be the ultimate management strategy. "What bird populations do usefully indicate is the health of our ethical values. One reason that wild birds matter—ought to matter—is that they are our last, best connection to a natural world that is otherwise receding." Our collective efforts to study, report, photograph and share information about birds may have some small effect on the preservation of, at the very least, our own "ethical values", and at best, foster a sense of responsibility in our grandchildren. Thank you, Phil, for all you do. Is it known for Garden Warblers to overwinter? Almost certainly saw one this morning Over Wyre; definitely wasn't a female Blackcap as noticeably bigger. Hi Charlie. Highly unlikely to overwinter I would say. Hard to think what it may be other than a Blackcap at 13cm which is only slightly smaller than a Garden Warbler at 14cm. Thanks Phil. I have in the past seen an overwintering female Blackcap and it wasn't that. A mystery! It was though interesting to see it at the top of a fruit tree, eating the only apple that hadn't fallen in the Autumn.